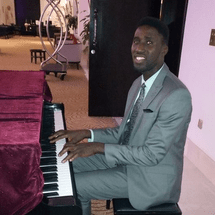 Enoch is a seasoned music teacher with over 6 years working experience in schools and music institutes, familiar with both British and American curriculum. He is graduate of B.A. Theatre Art/Music in the University of Jos Nigeria. He is skilled in playing the piano, guitar, violin, and drums, and also a vocal coach and choral co-ordinator. He has trained children as life-long learners in music theory, practical music, and art training sessions that provide cutting-edge skills for them to perform and compete globally.